Last week in Learn how to sing in tune – matching pitch 1 I looked at the first steps you can take to help you to sing in tune. That’s all very well, but what if you find that you’re not matching pitch well enough? What can you do to improve your pitching ability? Your friend tells you you’re not getting it right. What adjustments can you make so you can match her pitch correctly? have fun, and don’t take it too seriously! The pitch matching exercises I outlined last week might be too subtle for you if you’re a real beginner. Trying to match another pitch involves hearing the other pitch accurately, and then making tiny adjustments to your own vocal production. This may just be too advanced for you at this stage. Another way in is to get the instrument or singer to try and match your pitch rather than you trying to match them. Matching pitch is all about learning to listen in a new way. You may have got into a habit when trying to match an external sound (voice, instrument) of always singing above or below the pitch without realising it (see last week’s story about the guy who always sang lower than the pitch he was hearing). you sing a note and your friend either sings it back to you (or plays it on an instrument) at the same pitch. At first you may be surprised and it may not sound like the ‘same’ note. But gradually, you will begin to recognise that the note your friend is giving you is the same note as the one you’re producing. After you have perfected this listening training, you can then go back to trying to match the pitch as outlined last week, i.e. your friend produces a note and you try to match it. 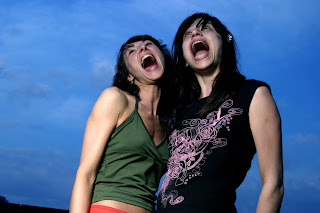 You may be able to match pitch perfectly, just not with the friend you’re singing with! Everybody’s voice is unique. Each voice has its own colour, texture, clarity, etc. Some people sing very straight, ‘pure’ notes, whilst others have a lot of vibrato. One person singing a note might appear to be singing a lot lower than another person singing exactly the same note. Some people always seem to be singing louder than everyone around them. One person might always sing slap bang in the centre of a note, whilst someone else may sing a little on the edge of the pitch. This means that our perception of whether we’re singing the same pitch as someone else depends a lot on their individual vocal production (see How do I know if I’m singing in tune? : Singing the same note, sounding different). If you’re not getting it right with one singing buddy, it might be an idea to try another singer to see if it makes any difference. maybe you’re asking for the impossible! If you’re trying to match a pitch, there’s always the danger that the particular note being played or sung is outside the range of notes that you can comfortably produce. You’re aiming for something that simply isn’t possible! This can very quickly put off a beginner, so very early on you need to establish that you’re inside your comfortable range. How can you do this? When you first start singing, the range of notes that you can produce (i.e. how high or how low you can sing) will be quite small. Get a friend that you feel comfortable singing in front of and sing a note (gently!) on an ‘ah’ sound. It might take a few goes, but find a note that is comfortable and effortless to sing. Once you’ve found this note, let’s assume that this is slap bang in the middle of your comfortable range. Then try gently sliding from this note up and up until you feel that it’s too screechy, or too much of a strain, or just uncomfortable. Go back a little way below this and let’s call this your highest note. Reverse the process for you lowest note. During this, your friend can write down what these highest and lowest notes are and then make sure that any pitch matching is done within this range. If you’re working on your own, you can use an electronic tuner and simply read off the note names when you get to your highest and lowest notes. There is a slight danger when trying to find the ‘natural’ range of your voice, especially when you don’t have much singing experience. Many of us when we start out get into bad habits by trying to impersonate singers we admire. This can result in us not using our own voices in the most ‘natural’, easy way, but can put strain on our vocal production. However, because we’ve been doing it for so long, it can feel very natural, even though it’s not really our own voice. Again, you can get a trustworthy friend to give you some feedback on this. Also, have a look at earlier posts such as: But I can’t sing that high!, Everybody has a place in the choir, Why people think they can't sing. You may find that you’re starting to be able to match pitch better and better, but not consistently. Sometimes you get it spot on, other times you miss entirely. Sometimes you hit it bang on at the start, but then you begin to waver and go off quite badly. This latter is probably caused by not having enough breath support. I don’t have enough space to go into breath support in detail, but you can experiment on your own to see the results. Imagine that you have a balloon living in your tummy. Now breathe in as deeply as you can (without lifting your shoulders) and imagine that the balloon is inflating inside you as big as it can be. Now sing a matching pitch (you might need to make a small adjustment at the start until you’re spot on) and keep on singing until all your breath has gone. Did you notice that towards the end your voice began to waver a little and you maybe went off pitch? Basically, the more breath you have deep down inside you and available to you in reserve, the easier and more controlled your sung note will be. So if you’re finding it hard to match pitch, maybe try different ways of breathing to see if that can help. Play, play, play with your voice and breathing and have fun – that’s the secret! too much going on at once! If you’re singing with a buddy and there’s nobody else there to give you feedback, you might be asking to much of him. Your singing buddy is having to sing a note themselves, which involves vocal production and listening to see if they’ve produced the note accurately. But they’re also being asked to listen to your note at the same time to see if it’s pitched correctly. This is very hard and might not produce the correct results. If your buddy is struggling, then this is the time to involve a third singer to listen to you both. As well as another person’s voice having different characteristics to yours, there are other elements at play in vocal production that can make a big difference. The most important one of these is how you sing your vowels. You might hear a choral conductor talking about blend in a choir. This is the aim for a large number of voices to sound so similar to each other that it’s as if a single voice is singing. Because of the different colour, texture, etc. of particular voices, singers are often moved around within a choir so that they stand next to other voices with a similar quality. But one variation that a whole choir can improve upon is vowel production. You can try this yourself at home: choose a vowel, say ‘A’ for example, and sing it in as many different accents as you can on the same pitch. Imagine that you are a very posh Londoner, an Italian diva, an oil man from Texas. You will find that each accent produces a very different sound, even though the note you are singing is the same each time. This is what can help with blend. Now that you’ve begun to match pitch accurately, try changing the vowel sound whilst singing the same note as your singing buddy until you feel that you have matched the sound perfectly. It should feel like there is just one person singing. Eventually, after lots of practice, it will become easier to match pitch, but often what is objectively ‘right’ (i.e. you are pitching correctly) might feel wrong. It might seem very obvious, but when you eventually get it right and match the pitch you need someone to tell you! When you begin to learn a new sport like golf, for example, you are taught about stance, swing, focus, etc. Sometimes you manage to hit the ball effortlessly and accurately, but don’t really know why. Gradually you need to get a feeling for when you’ve got the preparation right so that the shot will be perfect. For this, you need someone to point it out: “Great shot!”. Then you can begin to connect the experience with the result. When you pitch the note accurately and correctly, you need a buddy to tell you: “Spot on!”, then you need to note how you feel and what you did so gradually it will become second nature. Once you’ve mastered the ability to match a given pitch accurately, you may want to move onto singing in harmony with other voices. Next week I’ll look at how to develop the singing skills needed to harmonise in tune.